What is Drinking Skeptically, you may ask? (You are a skeptic after all, questions are expected.) 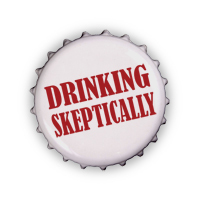 Drinking Skeptically is an informal social event designed to promote fellowship and networking among skeptics, critical thinkers, and like-minded individuals. It provides an opportunity for skeptics to talk, share ideas (and yes, drink) in a casual, relaxed atmosphere. We discuss the issues of the day and whatever else is on our minds. But most of all, we have fun while promoting skepticism, science, and rationality. Don’t drink? Don’t let that stop you from joining us! Some of the world’s most famous skeptics are teetotalers, and we are happy to have you! Remember that drinking skeptically means drinking responsibly. If there’s one thing science has taught us, it’s the effects of alcohol on the human body. The events are announced on meetup.com.